The Club has supported a number of filming sessions at the mines including: Countryfile, Hollyoaks, 4-in-a-Bed, Granada Reports, Seven Wonders of the NW, Question of Sport and more. Some of these films have been completed in one quick visit while others have involved reconnaissance, detailed risk assessment and further planning. The DCC can give advice about suitable locations depending on the purpose of your production. 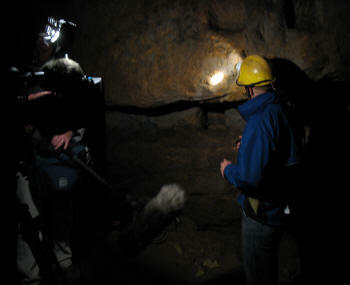 The DCC leases the mines from The National Trust who must be consulted about any filming. The National Trust website has a page about filming: http://www.nationaltrustimages.org.uk/filming-locations. However, if you are only interested in filming the mines for documentary purposes, experience has shown that the National Trust can be reasonably relaxed. If you contact the caving club at alderleymines [subject] Filming_proposal, we can help you make contact with the appropriate person in the National Trust as well as discuss suitable locations. If you want to make contact by telephone, please ring the Mine Manager (home number 01270 842767). We know that filming is often a last-minute affair but bearing in mind that the mines are managed by volunteers in our spare time, please allow sufficient time for us to make appropriate plans with you. Using film equipment underground creates a number of special issues. Firstly, light will be needed which may in some cases be provided by the caplamps of the people being filmed, by battery powered lights carried by the cameraman and crew (if any) or by lights powered from a generator on the surface. The type of lighting depends on the objective of the filming. Using a generator on the surface introduces additional risks but the DCC is well equipped to help with this form of lighting. The second issue with underground filming is the camera. In the past, this would be heavy and expensive and therefore at risk from contact with mud or sand in the mines. Nowadays, depending on the purpose of the film, high definition hand held cameras can provide good results making filming much easier. Sound recording can also be an issue: the mines are generally exceptionally quiet but the rock walls and roofs can give rise to echoes and have a tendency to deaden sound. Thirdly, there is access to the place where filming is to be carried out. The mines are largely freely accessible on foot but some people may be scared of the dark or the confined space. In simple cases, you may feel it is sufficient to arrive with suitable equipment and personnel and follow the leadership of the DCC to a location, to carry out the filming, and to leave the same day. However, more elaborate productions may require negotiation with the National Trust as well as a location reconnaissance, preparation of risk assessments, etc. The production route you choose will be largely your own choice but we cannot recommend too strongly that you discuss your aims with the DCC before making final plans. The mines have been visited by thousands of members of the public since 1970 and have also been a location for filming on several occasions. There are unusual hazards associated with being underground but the risks are controllable. The DCC can help with Risk Assessment and a sample is available HERE. The National Trust make their own arrangements but in general the DCC does not look for a fee. However, we welcome a contribution towards the expenses of individuals involved as some filming programmes have taken two or three visits by members at our own expense. If a fee is paid to the National Trust, the DCC does not usually get any share of it although we do the lion's share of the work. Therefore a separate donation towards the Club's costs managing the mines is always appreciated. The DCC has generators, lights and appropriate safety equipment although the suitability of this for your purposes is left to your judgement The DCC also has a small building across the road from the Wizard although the space and facilities are limited. If meeting space is required, the Wizard Inn may be able to make a room available (contact them direct on 01625 584000 or via www.thewizardofedge.co.uk). For information about parking, refreshments, etc., have a look at our page about the facilities on the site.